Rowena and I in front of some artwork near the pop up shops. My Outfit Details: white cotton v-neck by Ralph Lauren, faux fur vest from Fashionista's Market, black denim jeans by Andrew Charles, vintage Moschino belt (as seen in "Black & Gold Bliss" post), black lambskin Rocco mini duffel bag with black nickel hardware by Alexander Wang, ankle boots by Bruno Magli (can't really see 'em), necklace and bracelets from Macy's, Brandy Melville, and iKandy. Jam, Rowena, and I sitting at the White Room Transformation dining room table designed by Lauren Makk of TLC's Trading Spaces and A&E's Drill Team. Lindsey of Pineapple Ice and I at her booth in the pop up shops. Ariyaphon Southiphong (Andy South) and I outside near the food vendors. Favorite look #1 from the fashion show styled by Geremy Campos. 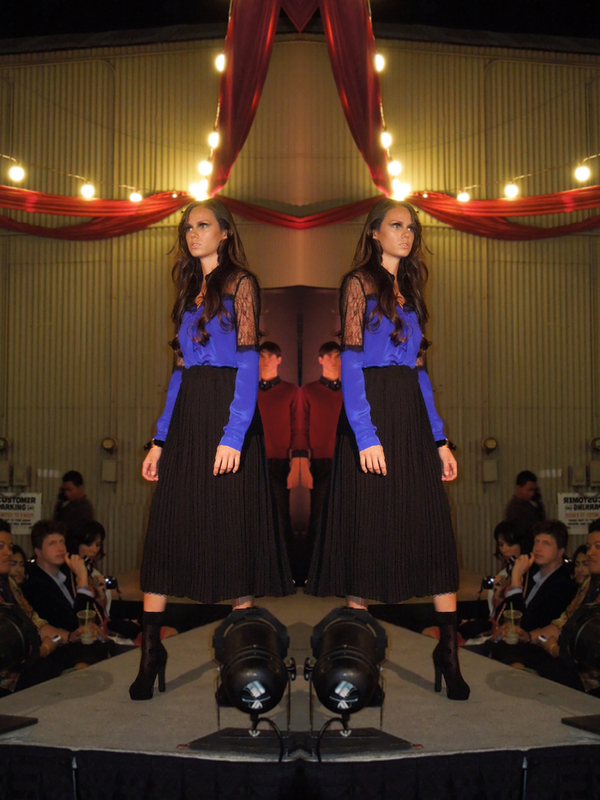 Favorite look #2 from the fashion show styled by Geremy Campos.